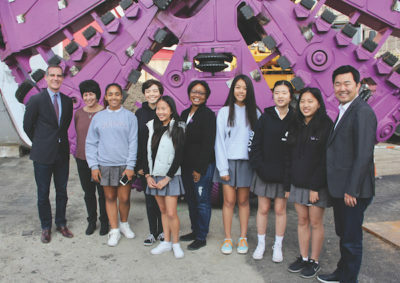 MARLBOROUGH students posed with Mayor Eric Garcetti and Councilman David Ryu in front of the cutterhead of one of the two TBMs. Pictured to the Mayor’s left are: Deborah Sealove, Sofia Head, Sofia Ellis, Rebecca Louie, Metro Deputy CEO Stephanie Wiggins, Eleanor Berger, Eileen Jung, Shine Park and Councilman Ryu. Youth was well represented at Metro’s unveiling of artwork that disclosed the winning names for the two tunnel boring machines (TBMs) that will drill the Purple Line Extension through Greater Wilshire and Miracle Mile. Entertainment at the event included a performance by students enrolled in the Marlborough Instrumental Ensemble program. The performers were: on flute, Eleanor Berger (9th grade) and Sofia Ellis (8th grade); on violin, Sofia Head (7th grade), Rebecca Louie (7th grade) and Eileen Jung (8th grade); and, on clarinet, Shine Park (8th grade). The performance was conducted by ensemble director Deborah Sealove, who has been teaching at Marlborough for 36 years. 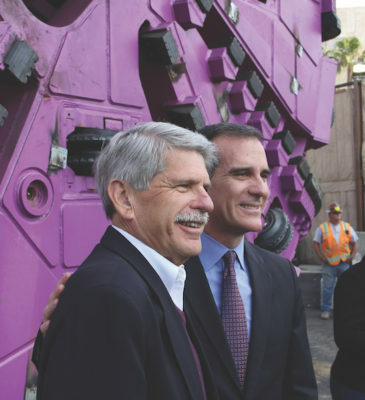 CIVIC LEADERS Zev Yaroslavsky and Eric Garcetti posed in front of one of the two TBM cutterheads. In his remarks about the progress being made in extending the Purple Line toward Westwood, Mayor Garcetti singled out former Councilman Tom LaBonge and former Supervisor Zev Yaroslavsky for their leadership and support over the years. MUSICIANS from Marlborough School played at the Metro event. On stage from left to right are Eleanor Berger, Sofia Ellis, Sofia Head, conductor Deborah Sealove, Eileen Jung, Shine Park and Rebecca Louie.